Historical GIS is the use of GIS data to document the given geography of an area in history. 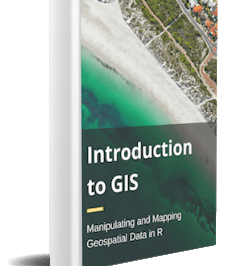 GIS can be used in historical geography research to map out ancient areas and the changes in cities and places over time. 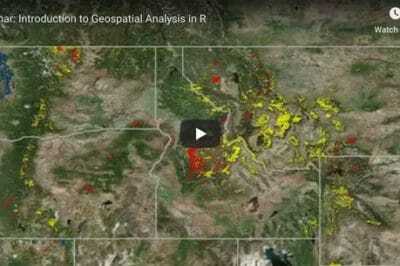 There are several academic institutions focused on the use of GIS in historical geography. The Ancient World Mapping Center promotes cartography, historical geography and geographic information science as essential disciplines within the field of ancient studies through innovative and collaborative research, teaching, and community outreach activities. Google Ancient Places uses geocoding code from the Edinburgh Geoparser to geolocate ancient places found in scholarly texts. More depth about this project is reviewed in the article, Google Ancient Places: Exploring the Geography of Ancient Places in Text. Pastmapper is an innovative project from Brad Thompson who is seeking to document online the geography of cities over time. 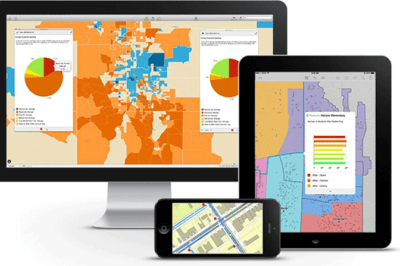 Thompson is seeking to answer the questions of “What was here?” and “Whatever happened to..?” by creating maps that look at the state of various cities historically by creating GIS layers that reflect how a city looked year by year. A lot has changed in the last 158 years. Hills have been leveled, coastlines have expanded, and points of interest have been renamed. A staggering number of streets have been closed, opened, renamed, or widened. Building numbering in San Francisco changed completely in 1861, so even the street addresses don’t match their 2011 counterparts. 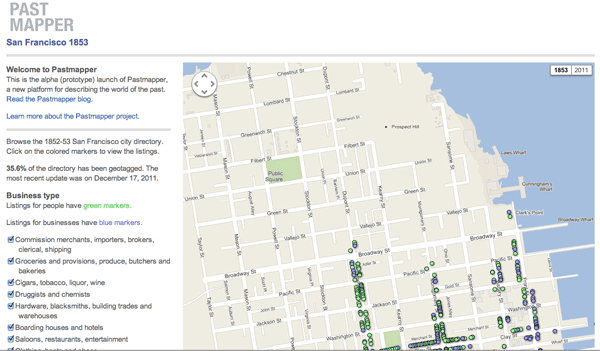 The online map is built using Google Maps and has a toggle button that allows viewers to switch between streets from 1853 and today’s San Francisco streets. Also mapped are point data showing the location of people and businesses from 1853 based on the 1852-53 San Francisco city directory. To broaden the scope of the project, Thompson is looking for help from volunteers who can help create historical layers by vectorizing georeferenced historical maps. The process for volunteers to help hasn’t been formalized but the beginnings of a “how to” section are being created by Thompson on his blog. Thanks to Stanford University’s Classics Professor Walter Scheidel and Stanford Digital Humanities Specialist Elijah Meeks, you can now navigate through Ancient Rome. Broadly mapping out the transportation options in 200 C.E., the interactive mapping application allows user to navigate through the Roman Empire based on both time and expense. So what has been mapped? 751 sites, most of them urban settlements but also including important promontories and mountain passes, and covers close to 10 million square kilometers (~4 million square miles) of terrestrial and maritime space. 268 sites serve as sea ports. The road network encompasses 84,631 kilometers (52,587 miles) of road or desert tracks, complemented by 28,272 kilometers (17,567 miles) of navigable rivers and canals. The mapping application is quite complex and allows the user to model travel through the three continents of the Roman Empire using 14 modes of land travel (ox cart, porter, fully loaded mule, foot traveler, army on the march, pack animal with moderate loads, mule cart, camel caravan, rapid military march without baggage, horse with rider on routine travel, routine and accelerated private travel, fast carriage, and horse relay) and water travel using two different types of boats. The application models travel in terms of time and costs between two points based on a selection of different travel modes, and times of year. Also located at Stanford University, the Spatial History Project seeks to bring “together scholars working on projects at the intersection of geography and history using Geographic Information Systems (GIS) in their research.” The projects listed marry geospatial technologies with historical research. Use the Google Earth to journey along with Alfred A. Hart, who between 1864 to 1869,took 364 pictures along the line of the Central Pacific Railroad. Click on the photos along the trail route to see both historical and modern day photos of sites he photographed. Or view a dynamic timeline of botany samples as they were collected across California between 1848 and 2008. The Archaeology Data Service housed at the University of York has created Mapping Medieval Townscapes: A Digital Atlas of the New Towns of Edward I. A group of researchers from Queens University Belfast, working with funds from the Arts and Humanities Research Council, created this digital atlas of the towns created by King Edward I between 1277 and 1303 such as Conwy, Newborough, Rhuddlan, and Aberystwyth. Drawing on the work of archaeologists, GIS experts, and other specialists, this atlas contains copious information on each locale. Visitors can look through each interactive map, and toggle various data layers, such as town walls, trenches, streets, and so on. Along with these maps, visitors can also read about how each map was created, and download the data sets used to generate each map. Harvard University hosts the China Historical GIS site. The site offers free access to GIS data covering Chinese history between 221 BCE and 1911 CE. A presentation from the 2002 Esri User Conference entitled Visualizing Urban History Using GIS reviews a case study that used GIS to study changes in Austin Texas over time. GIS for History is a web site with lesson plans for teachers and project ideas for students on how to use historical census data and GIS to understand the history of the United States. The student level is aimed toward high school students and undergraduates. Article first published May 3, 2003 and last updated December 21, 2011.